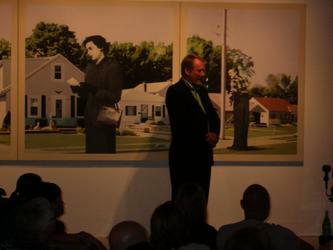 I attended a Gallery Talk by Martin Mull at the San Diego State University Art Gallery this evening. Mr. Mull spoke and answered questions for about 45 minutes to a room full of people, many of which were art students at the university. Martin Mull is different from most of the other celebrity artists listed at Pop Life Art. Martin Mull is an artist that became an actor rather than the other way around. Martin Mull began drawing as a small child and continued drawing and painting throughout his youth. He went on to earn both a bachelor of fine arts and a master of fine arts from Rhode Island School of Design. He says that it was just luck that he became an actor. What he really wanted to be and what he considers himself is a painter. I had a chance to speak with him briefly. I asked him if he would be offended to be called a “celebrity artist”. He said that he would rather just be called an artist. I also asked him if he thinks his acting career helped or hurt his painting career. He said that for a time, it hurt. He said that people didn’t take him seriously as painter. He said “they thought I was like Red Skelton, painting clowns”. Martin Mull’s artwork is very impressive but somewhat odd. His paintings often consist of 1950s era images of people in strange poses or positions overlaid onto sometimes unrelated scenery. He says that the images are largely based on photos from old Life and Look magazines. His paintings have a kind of dreamlike quality to them. See more Martin Mull links at the Pop Life Art homepage.